Through the years, leading manufacturing companies of washing machines try to find the formula in lowering the water temperature without sacrificing the cleaning power of the machine. Now, there’s the GE Profile Energy Star, or WPDH8900, a washer that does exactly just that. GE’s WPDH8900 front load washing machine combines good performance and appealing design to satisfy the laundry needs of today's consumers. The greatest thing about the WPDH8900 is its colossal capacity because of its mega-drum feature, which is one of the largest in the market today. This load capacity can accommodate a minimum of 17 pairs of jeans. This means that more shirts can be fitted in. Comforters, drapes, and other heavy loads can also be washed using this washing machine. Of course, this large capacity would translate to saving more time, water, and energy when doing the laundry. Read on the following features and benefits to help you decide whether this particular model is best for you. It features the Steam Refresh and Steam Assist, which use the power of real steam to thoroughly clean clothes with the gentlest care. Clothes last longer because of the gentle lifting power of steam that can help remove even some of the toughest stains without damaging the fabric. It also helps reduce wrinkles and odors some fabric types are known to develop even after wash. Steam can be used to refresh clothes that were lightly worn, and not really dirty, or slightly wrinkled garments. It detects size of laundry load and adds exact amount of water at the lowest temperature, letting consumers save on water and energy. It also removes clothes’ stains by pressing on the Stain Inspector button on the controls. Users may either adjust the settings or leave it to the WPDH8900 to do its tricks. After all, it has been designed to remove 40 kinds of stains in clothes. It allows not having to add detergents to the washer for at least 6 months. Users just need to buy a Smart Dispense pedestal, the SPBD88OJ. With this, the washer will automatically pull the right amount of detergent and softener from the SmartDispense pedestal. This way, none of these laundry products will be put to waste. It enables the communication between the dryer and the washer. The washer instructs the dryer which presets to use to achieve better clothing care and time efficiency. – With a maximum speed spin of 1300 rotations per minute (rpm), the WPDH8900 model outspins almost all of its competitors in the market by 100 rpm. This, of course, translates to savings not only on time but energy as well. One great thing about the WPDH8900 is its mega-sized tub that washes more laundry items in one loading than other washers in the market today. It is Energy Star rated, saving up to one-third of the energy bill without sacrificing its features, style, or comfort of use. Users have also cited how the washer effectively cleans clothes thoroughly despite the protection it provides. It also automatically puts detergents and softeners by itself and even has a good speed spin that results in shorter laundry time. Much of the benefits cited by consumers come from its numerous settings that are designed to achieve right wash for different types of laundry, from comforters to regular clothes. 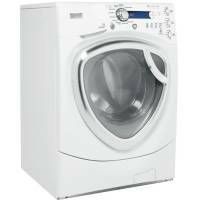 Front load washing machines like WPDH8900 cost much more and, therefore, require a larger initial cash-out for purchase. Even the care and maintenance costs are greater than those of other washing machines. This is one of the reasons consumers may think twice before buying this washing machine. The WPDH8900 is truly promising in the sense that its advantages totally outweigh its disadvantages, not only in performance but also in quality and efficiency. It makes the task of doing laundry a lot easier because of its mega-sized tub, which allows for fewer loadings of clothes and faster laundry times. With this, consumers are able to stay in the living room or bedroom to rest instead of waiting for the wash cycles to finish in the laundry area. The Steam Wash Cycle is also a very significant feature of this model, the WPDH8900, as it removes soiled dirt thoroughly while being gentle on clothes at the same time. Therefore, consumers are able to maximize the use of his or her clothes. All these are pretty much the considerations of a consumer when buying a washer. With these, the buying trend for washing machines will definitely be geared more and more toward the likes of GE’s WPDH8900. We have had this washer 4 years and have had to get it repaired 5 times. With what we have put into repairs, we could have bought a new washer. We are so irriated we bought this piece of garbage. We know the repair guy by name and he says it is "one of GE's better washers". Nice.